“The time, care and enjoyment dedicated to each of the seeds is priceless. The cost of inaction yes, it has a price” Celia Teira. June 2017. “El tiempo, cuidado y disfrute dedicado a cada una de las semillas no tiene precio. El coste de la inacción sí.” Celia Teira. June 2017. The Social Tour departure was on February 27th 2017 from Cazalla de la Sierra (Sevilla). It did not stop until its arrival in Vienna, on April 1st. 9 stages: Cazalla de la Sierra – Numancia de la Sagra – Madrid – Zaragoza – El Masnou – Francia – Feldkirch – Salzburg – Viena. Colectivo Trespiés. Centro AMEDIAR Zaragoza. Verein M.U.T. Artkolè Verein. Improspañol Viena. 200 people were directly involved in different ways (of course I took my time counting them!) and more than 200 people are following the Social Tour in social media. 2 months were required to organize it previously. 2 months more to digest, evaluate and spread this experience-adventure. Having different points of view and perspectives to assess situations is one of our most important learnings about interacting with people. my “bravery”, for “not being stopped by my fears or lack of resources”. I have also been praised for “doing what I intend” (and many other comments, this is not the place to include them). From this point of view, YES WE PASSED!!! We give value to our values, we were living the Social Tour with value and courage. We have made the dream come true. Maria from Proyecto Kieu (Toledo) encourages younsters to be Quijotes and Quijotas in Numancia de la Sagra. Don’t you think that we need more people feel that “changing the world is not foolish, nor utopic, but a matter of social justice”? From the perspective of its Impact for people, projects and communities/environments were actions were done. Once again, WE PASSED! It is required a qualitative analysis to measure this value. Testimonies of people involved really show the Social Tour impact in their lives, in theirs organizations and communities. Thanks you all for your words! And finally, the perspective of sustainability. In financial terms: how much did we invest and recover? How much did we earn?… We have included a financial chart with the precise amounts, so you can consider the balance of costs and benefits by your own. and many other human variables (that Excel has no function for them). Sevilla. Social Tour Inauguration in Gallo Rojo. Support of Cantarell family, Álvaro in Gallo Rojo and all the fellows from Movimiento Impro. Cazalla de la Sierra. Community Session. Support of Enric and del Molino family, of Enrica and Abraham in Espacio de la felicidad y la cultura contemporánea of Cazalla. Almendralejo (Badajoz). Improv workshop. Support of Nacho’s family and his Theatre group Sepia. Numancia (Toledo). Education for Instructors. Support of María family and Kieu Project. Lavapiés (Madrid). Image theatre… Support of Sonia and Matteo from Orbita diversa in La Mala Mujer. Support of Arkaitz y Diego. Torrelodones (Madrid). Community session. Support of our families, and support of Verónica, Elena and Laura, in Ceadi. Zaragoza. Introducing the Project, social inclusion dinamics. Support of María y Wuatu. Support of Rocío, Mamen y Lourdes in Amediar. And food with Alejandro y his mother. Masnou (Barcelona). Improv workshop. 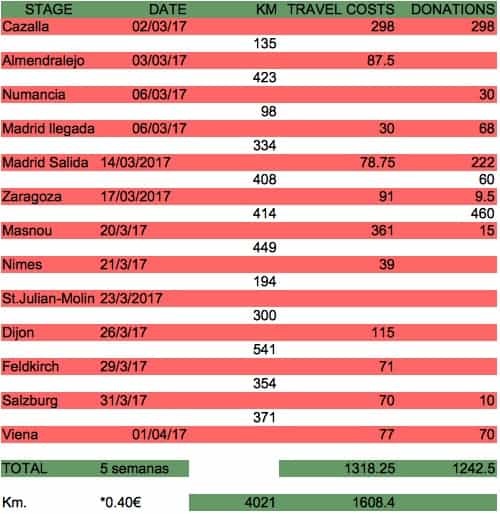 Support of Bernard family and los Playasos. Support of las Anas in Cerdanyola. Dijon. Theatre workshop. Support of Spallier family and Philippe and Emilie (Escuela Eiffel). Feldkirch (Austria). Visiting houses of refugees. Support of Allgäuer family and Andreas in the community house. Salzburgo. Theatre for Inclusion workshop. Support of Marilia family and her group of Theater und Performance Werkstatt. Viena. Introducing the Project, social inclusion dinamics. Support of Improductive family and Alex from M.U.T. Linking People: people who link us to other people to keep moving on. THANKS! Caring People: who hug us, fed us, loved us and listened to us. THANKS! Patrons: people who trust on us and gave us money for our traveling costs. THANKS! Professionals: who share their work and professionality in performances and actions. THANKS! Participants: who shared with us their bodies, feelings and ideas. THANKS! People who appear on our way and exchange experiences and help. THANKS! What do we take from the Social Tour? Positive interactions with people through actions are followed by a present, a video called “Value Pills”, given to each one of the projects we met. Each stage is also shared in the blog and pictures uploaded in Fb. I also consider important to keep in touch and take care of all the people/supporters through mail and social media. To my mind, this is what make us different: our work is focused on people. As a result, we all have been knitting the Social Tour NET. I hope it is a SUPPORTIVE NET where you can move freely, meet other people and projects, respect the rhythm of each interaction, and strength confidence links to make this NET a common wealth. It will be a NET done by and for all of us. And last but not least, an assesment of the team work sustainability. We were three people most of the time to remain viable in a cooperative way. We spent many hours preparing each stage, its performance and welcome. It was necessary to be focused on every need while we moved: not only the basic ones, but facilitation, documentation… After each stage, time was spent to make assessments, spread news in social media and editing videos. Too much work and energy on it, and conflicts come up also. Sometimes we felt without enough energy to keep moving… but love, encouraging words and carings received from so many people charge us!! The dream began 5 months ago… and the Social Tour has become a reality. The doors for a new dream are opening up now: Can you imagine a Social Tour that knit nets for local and sustainable development in the Iberian Peninsula? The dream is about worthing the work and professionality of people, connecting with more people and social projects, and making local institutions get involved in the responsibility of generate policies, practices and cultural values related to social inclusion for our coexistence.